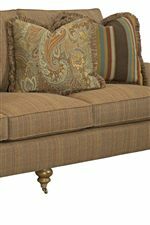 Subtly elegant design accents dress up this comfortable sofa, making it a fabulous centerpiece for traditional room decor. 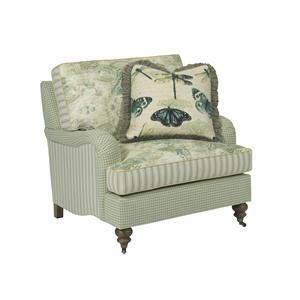 Its handsome, classic look comes from its use of traditional, English arms, turned legs, and welt cord trim. 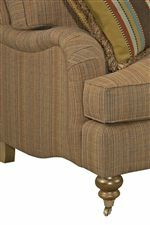 Customize this sofa to your liking with choice of cushion comfort, wood finish, body fabric and accent pillow colors. The Greenwich Traditional Sofa with English Arms and Turned Legs by Kincaid Furniture at Hudson's Furniture in the Tampa, St Petersburg, Orlando, Ormond Beach & Sarasota Florida area. Product availability may vary. Contact us for the most current availability on this product. Seat Support Sinuous wire springs. 8-way hand-tied coil construction available for an additional charge. Padding & Ergonomics High-density foam cushions come standard. Excel, Blendown, and Qualux cushions are available for an additional charge. 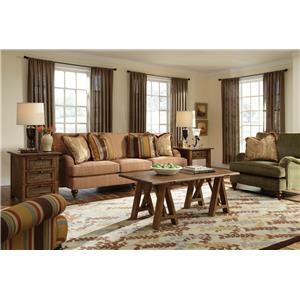 The Greenwich collection is a great option if you are looking for Traditional furniture in the Tampa, St Petersburg, Orlando, Ormond Beach & Sarasota Florida area. Browse other items in the Greenwich collection from Hudson's Furniture in the Tampa, St Petersburg, Orlando, Ormond Beach & Sarasota Florida area.